The West Pier was illuminated first in 1992 and then again in 1996 courtesy of Seeboard. The West Pier Trust pays the electricity bill. 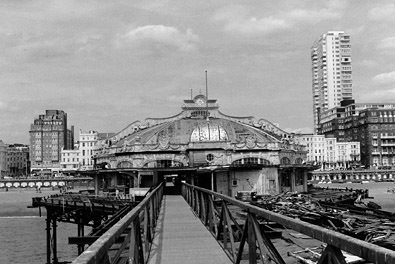 The Concert Hall was added to the pier in 1916. It had its own orchestra/dance band which played for the entertainment of those visiting the pier and during the 1960's it held Old Time Music Hall Concerts. Books of tickets for these events are now strewn across the stairways and floor of the Ocean Restuarant. After the 2nd World War in the 1940's the Concert Hall was converted into a restaurant/cafe and there are provisional plans to return it to this use during the current restoration. The architectural and decorative style used to ornament the West Pier followed the model set by the Royal Pavilion. 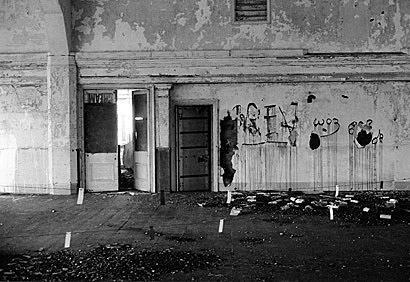 This is nowhere more evident than in the domes and spires of the kiosks and restrooms.This building, which currently serves as a nest for the starlings who currently occupy The West Pier, was originally erected as a restroom and observational tower. A spiral staircasewould have lead up to the upper level from which visitors to the pier could have viewed either the sea or the rest of fashionable society promenading along the sea-front. 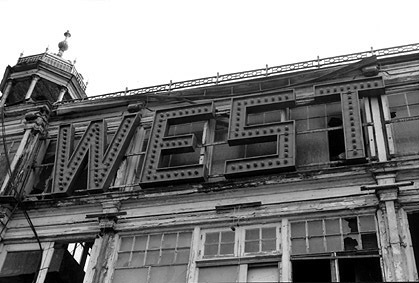 From 1890 onwards, the owners of the West Pier supplemented the revenue they made from admission charges to the pier by letting out kiosk space on the pier to local businesses. Maynards, who are a local Sussex confectionary manufacturer, and makers of Maynards Wine Gums, owned this kiosk. At one point landing stages surrounded the West Pier although most of these no longer exist. From these stages paddle-steamers would take visitors on day trips to the Isle of Wight or Eastbourne. In fact, many of the early postcards sent from Brighton by holiday makers, which I discovered whilst researching this project, mentioned their seatrips along the Sussex coast on paddle-steamers like the SkyLark. The Ocean Restaurant is upstairs in the pier-head building - formerly the Pavilion Theatre. This picture shows the Ocean Restaurant in its present very sorry state. On the floor are discarded books of tickets for the Old Time Music Hall Shows held in the Concert Hall during the 1960's. During the 1950's musical entertainment in the Ocean Restaurant was provided by a juke-box, which seems very removed from the performances given in the theatre during the earlier part of the century. 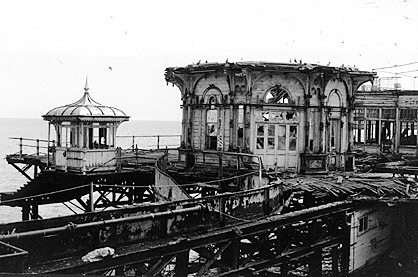 The south part of the pier was the first to be shut to the public i n 1970 as it was no longer structurally safe. 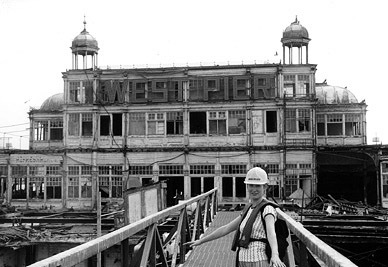 The rest of the West Pier was finally closed down in 1970. The stage was located at the south end of the Pavilion Theatre. 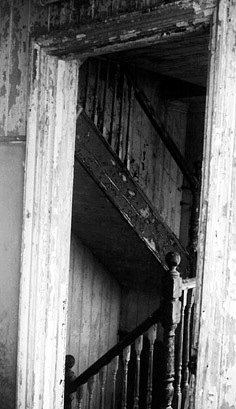 The artistes stairs were situated at the back of the pier-head building and lead to the actors dressing rooms. The many performers included Max Millar who was a local resident, living in Brighton's Kemptown district. One of the most successful plays staged in the Pavilion Theatre was "The Ghost Train" written by Arnold Ridley, who played Private Godfrey in BBC Television's War-time sitcom "Dad's Army". There are further "Dad's Army" connections with the West Pier as Bill Pertwee, who played the Airwarden in the series, also made regular appearances in the Old Time Music Hall Concerts. 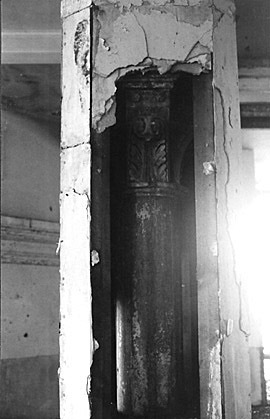 This decorative pillar is located in the Ocean Restaurant. 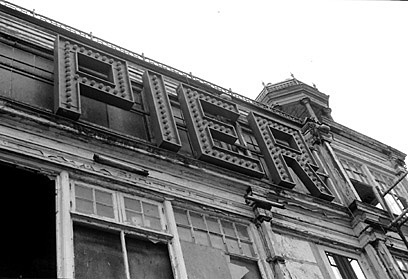 It dates from the original 1893 Pier-head building but was covered over in the 1940's when the Theatre was converted into a restaurant and arcade. 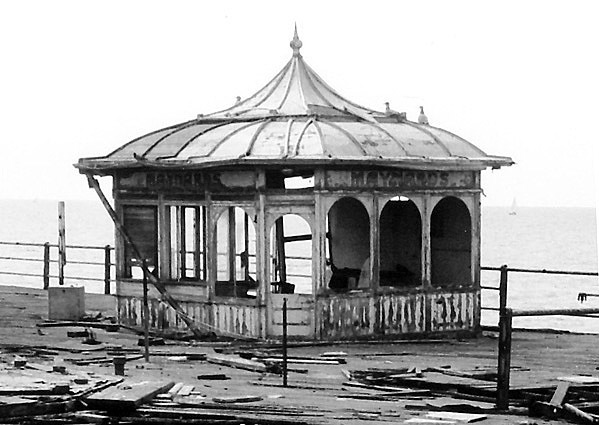 The West Pier Trust intends to restore the Pavilion building back to its original style and all these decorative features will therefore be revealed.